Located at 4500 ft. elevation this hunt is the rugged western hunt you've always wanted. The roadless area has varying types of hunting terrain, from heavily forested big game habitat to open glades and regrowth. We drive to base camp and hunt out each day by horseback to reach remote hunting locations; you won't be saddle sore before the hunt begins. Excellent success rate on trophy elk. Fully guided full service tented camp deep in prime elk habitat. The lodge provides first class accommodations, private rooms with bath, excellent home cooked meals and great hunting. Hunters travel by ATV's and 4x4 trucks. Still- hunting, ground blinds and tree stands consistently produce trophies. Mountains with meadows, big timber and some clear cuts provide excellent big game habitat. Enjoy a true western hunt with all the comforts of home. 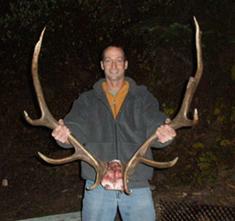 You will be hunting big bulls during the rut. We use tree stands over wallows and watering holes to give our hunters the greatest opportunity to harvest a trophy bull. 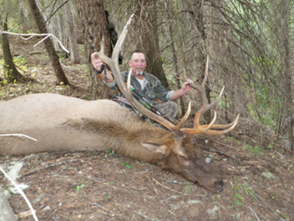 When the elk are becoming more active, the chance of calling in a trophy bull increases. Our guides are seasoned archery hunters experienced at bugling and cow calling techniques. All of these tactics can be successful.